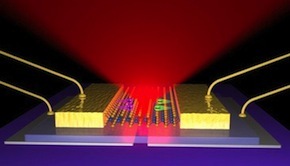 Researchers at the University of Washington (UW) have demonstrated electroluminescence in a flexible, mechanically strong construct of the semiconductor tungsten selenide only three atoms thick. The researchers harvested single sheets of tungsten selenide (WSe2) using adhesive tape, a technique invented for the production of graphene. They used a support and dielectric layer of boron nitride on a base of silicon dioxide on silicon to come up with the thinnest possible LED. The LEDs now used in most consumer electronics are rigid and are hundreds to thousands of times as thick as the material being developed at UW -- which the team characterizes as 1/10,000th the thickness of a human hair. Existing inorganic LEDs are not appropriate for use in bendable, foldable applications such as electronic devices and displays integrated into clothing. Organic light-emitting diodes are the usual candidates for such applications, but the techniques being pioneered at UW can produce devices that are not only much thinner -- and stackable -- but also far more versatile. Read the rest of the story at EE Times.